WOW!!! Live in one side rent the other. 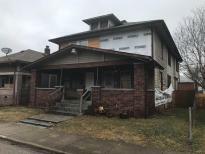 Spacious home in need of some repairs, but could make a great investment. Property located right in the heart of redevelopment area. Just down the street from Brookside Park and convenient to transportation.